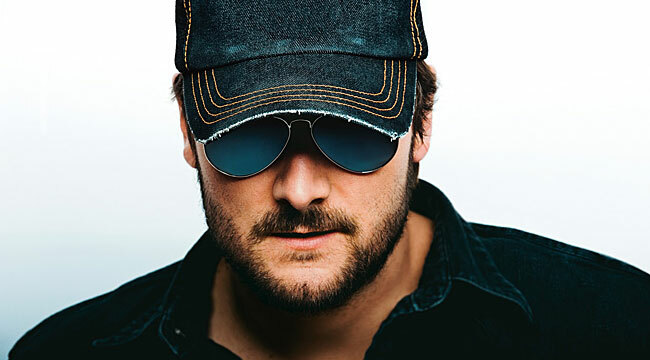 Resting at his Nashville home for a 12-hour break after a show in Las Vegas, country singer-guitarist Eric Church sounds a little hoarse. “I caught a cold out in Vegas of all places, so I’m trying to regroup,” he says matter-of-factly. A cold isn’t going to hold Church back. Ever since releasing his new studio album, The Outsiders, in January, he’s been on a roll. The follow-up to the platinum-certified album Chief (the Grammy-nominated 2012 Album of the Year by both CMA and ACM), The Outsiders debuted at No. 1 on the Billboard Top 200 Albums Chart and the Billboard Country Albums Chart. He spoke to us via phone about his terrific new album. That opening track on The Outsiders really sets the tone for the album. Talk about what inspired the album? Up until to the Chief album, we had always been more obscure, which I like. Chief was a big commercial success, which was great. I didn’t want people to think that that’s what we were going to do to have more hits. I wanted this album to be completely different, almost concept style. Being the first track and the first single, I wanted people to know that this is not what they thought. I wanted them to feel that. I wanted them to know it was going to be something artistic and creative. I didn’t know how it was going to go. I knew it would be a shock when you heard that first song and it changed time signature three or four times. I knew that was going to be a challenge for some people, but I wanted them to know it was going to be about the creativity and not about the commercial times. Do you see the album as a continuation of the outlaw attitude that existed in country music years ago when Waylon and Hank Williams Jr. and Willie were popular? I don’t know. I usually hate that characterization. I feel like we always go back to that. For me, it’s just at a time when I feel like the format — and most formats — have become homogenized. They’re the same thing over and over—the same sounds and the same subject matter. It’s a matter of doing something different and showing what the albums mean to our career. We’re playing for 14 and 15 thousand people in the first six shows of this tour. Out of the 26 songs we play, 23 songs have never been No. 1 songs. Most of them have not been top 10 hits. Our career has been built on the album concept. I wanted to really re-enforce that with The Outsiders and make sure people know that’s the most important thing to me. I don’t care that everyone out there is doing the singles and the downloads. I think they’re wrong. We got here because we gave people the entire package. They sing album cuts as loudly as they sing the singles. You’re a fan of hard rock acts like Metallica and AC/DC. Yeah. I listen to everything. When I was younger, I was a fan of older country and, yeah, heavier rock ’n’ roll. We ran the gamut and in between there were people like Seger and Springsteen. I listened to a bunch of stuff. Growing up in North Carolina, I got a fair amount of folk, Appalachian and bluegrass music. I love the guitar work on “Cold One.” Is that you playing? That’s not me on that one. I wish, buddy. There are a couple of spots where my producer Jay Joyce, who’s sneaky about it, will make me play a lead and says he’ll replace it later and then never replaces it. But that’s not me. “Give Me Back My Hometown” is such a great song. Was there one particular incident that inspired it? To me, there’s nothing lonelier — and I think everybody has been there — than when the person you are with leaves you where you are at. All of a sudden, the place that should be your comfort becomes haunted. Everywhere you go, there are memories. Even though that person left, that person alienated you. I was walking around a venue and I heard our road tech say, “That’s so damn rock ’n’ roll.” I started thinking about what rock is and what it isn’t. Some people think it’s the drugs and the planes and stuff like that but to me it boils down to one thing—playing music for the love of playing music whether you’re successful or not. That’s the most rock ’n’ roll thing you could do. That’s what the song is about and we used these historical references to bands and revolutions that rock ’n’ roll started. It was more than the music, it is what the music started. We just tried to paint it around that perspective. “The Outsiders World Tour” will use a much more high tech design and will offer fans a 360° view. Talk about that. I wanted to get back to our last tour, the “Blood, Sweat and Beers Tour.” We got jerked out of the smaller clubs and the next thing I knew, we re in an arena. It was a little bit of whiplash for me. I missed the vibe of a club or theater when everyone is on top of each of other and that spirit is moving. We took a year talking about it and by surrounding the people and having in-stage pits you almost create that feeling that we used to have where everyone is right there with you. That’s what I was trying to get back to. Our stage is sloped from back to front so it goes from nine to three feet. As I walk down the ramp, I’m in with the people. It’s neat too because as we walk around the stage you actually disappear into the crowd at times. We’ve done some general admission on the floor when it makes sense. When it works out and can be done with the building, it’s a lot of fun. How do you think the hard rock outfit the Pretty Reckless is going to go over opening for you? I think it’ll be great. It’s one of those of thing where it just fits the vibe of what we’re trying to do with The Outsiders and it fits creatively. I think it’s going to work out great.